Liberty Mutual Group, more commonly known by the name of its primary line of business, Liberty Mutual Insurance, is an American diversified global insurer, and the fourth-largest property and casualty insurer in the United States. It ranks 68th on the Fortune 100 list of largest corporations in the United States based on 2017 revenue. Based in Boston, Massachusetts, it employs over 50,000 people in more than 900 locations throughout the world. As of December 31, 2016, Liberty Mutual Insurance had $121.7 billion in consolidated assets, $102.5 billion in consolidated liabilities, and $38.3 billion in annual consolidated revenue. The company, founded in 1912, offers a wide range of insurance products and services, including personal automobile, homeowners, workers' compensation, commercial multiple peril, commercial automobile, general liability, global specialty, group disability, fire and surety. Liberty Mutual Group owns, wholly or in part, local insurance companies in Argentina, Brazil, Chile, China (including Hong Kong), Colombia, Ecuador, India, Ireland, Malaysia, Poland, Portugal, Russia, Singapore, Spain, Thailand, Turkey, the United Kingdom, Venezuela and Vietnam. In the United States, Liberty Mutual remains a mutual company where policyholders holding contracts for insurance are considered shareholders in the company. However, Liberty Mutual Group's brand usually operates as a separate entity outside the United States. In other countries, subsidiaries are often created in countries where legally recognized mutual company benefits cannot be enjoyed. Liberty Mutual was founded in 1912 as the Massachusetts Employees Insurance Association (MEIA), following passage of a Massachusetts state law requiring employers to protect their employees with workers’ compensation insurance in 1911. The first branch office was opened in 1914, and later that year, the company wrote its first automobile insurance policy. The company was founded as a Massachusetts Mutual Company, where its insureds have ownership in the company. The name was changed in 1917 to the Liberty Mutual Insurance Company and, through partnerships, the company began offering full-coverage auto policies. In 1964, Liberty Mutual Insurance Company began offering life insurance through its Liberty Life Assurance Branch. In 2002, the company converted into its current mutual holding company structure. The conversion was controversial, as it proposed to give policyholders an interest in the mutual insurance company, which some policyholders believed would dilute their interest in the overall company and limit their dividends. A lawsuit was filed, alleging that information provided to policyholders was misleading. Liberty Mutual settled the lawsuit in December 2001, which required additional disclosure and limited certain compensation to company officers and directors. Despite these concerns, the plan was approved by voting policyholders around November 2001. Leveraging the greater flexibility of the mutual company structure, Liberty Mutual transformed from a single-line, highly regional insurer to one of the world's leading property and casualty insurance companies. Liberty Mutual's growth has been both organic and through acquisition. Early acquisitions were small, but Liberty Mutual has made several large acquisitions over the past decade, including the high-profile acquisition of Safeco Corporation in 2008. Liberty Mutual agreed to acquire all outstanding shares of Safeco for $68.25 per share, for a total transaction price of approximately $6.2 billion. The result of this activity was an increase in revenue from $6 billion to over $30 billion in twelve years. In 1999, the company purchased Wausau Insurance Cos.
Liberty Mutual created a television commercial in 2006 about people doing good things for strangers, reporting that the "overwhelming" positive response they received for the ad led to their decision to create the website The Responsibility Project. Liberty Mutual is also the sole corporate sponsor of the long-running PBS documentary series American Experience and has produced special commercial messages for airing during American Experience broadcasts. In 2011, as part of the company's "Real America" campaign, the company introduced two new commercials featuring Sacagawea and Paul Revere. In 2011, the company began construction of the Liberty Mutual Tower, a 22-story skyscraper as part of its World Headquarters Expansion Project. The building received its certificate of occupancy in June 2013. In May 2017, Liberty Mutual Insurance has completed its acquisition of Ironshore Inc.Hamilton, Bermuda from Fosun International Limited for $2.93 billion. Liberty Mutual conducts all of its business through four strategic business units: US Consumer Markets, Commercial Insurance, Global Consumer Markets, and Global Specialty. A Liberty Mutual booth at a street fair in Andover, Massachusetts. Passenger automobile, homeowners, life, annuity, and other property and casualty insurance products are available via Liberty Mutual's US Consumer Markets line. These products are branded under the Liberty Mutual Insurance and Safeco names, and are distributed via a vast network of over 2,300 sales professionals. Other distribution means are call centers, third-party producers, and the company's own website. Over 10,000 insurance agencies across the United States carry Safeco-branded products. Property and casualty, as well as group benefits commercial insurance products fall into two distinct categories: Business Insurance and National Insurance. The former caters to businesses with fewer than 1,000 employees, while the latter serves businesses in certain industries or which have greater than 1,000 employees. Group benefits products include disability insurance and group life insurance. Localized insurance companies sell Liberty International's products in 18 different countries and markets. International products are offered to both individual and business customers, and include property and casualty insurance, as well as health and life insurance products. The largest international product offering is passenger automobile insurance for private individuals. The Global Specialty insurance line offers specialty products, such as marine, energy, aviation, professional liability, and crisis management, offered through 40 Liberty International Underwriters offices worldwide. In addition, Liberty International Underwriters provides global multi-line insurance and reinsurance written on its Lloyd's Syndicate 4472 platform. Global Specialty also includes reinsurance products offered through Liberty Mutual Reinsurance. Founded in 1954, the Liberty Mutual Research Institute for Safety has studied the occupational safety and health of workers. Its scientific contributions include machine safeguarding guidelines, the Cornell-Liberty Survival Car, and ergonomic guidelines that have informed the basis for national and international safety standards. More recently, the Institute developed the Workplace Safety Index, which is an annual ranking of the leading causes of the most disabling occupational injuries in the United States. The Institute's scientists conduct field and laboratory experiments to study the major causes of work-related injury and disability, publishing their results in peer-reviewed scientific literature. Institute findings are the basis for safety programs, recommendations, and software used by Liberty Mutual loss control consultants in order to help policyholders enhance worker safety. The Institute’s work is non-proprietary, and is available to the public. According to The Fair Labor Standards Act, an employee is entitled to file a lawsuit against their employers. In late 2012, the company won an appeal granting it the ability not to pay employees for work performed on an overtime basis. Pursuit was considered an award for the insurance industry as a whole. In this specific case, Liberty Mutual failed to appear. Instead, they relied on an amicus brief filed on behalf of the US Department of Labor. The Court decided, based on the amicus brief, that claims personnel are exempt "Administrative Employees" and not eligible for overtime pay, further supporting the insurance industry's goals. In late 2012, the California Supreme Court depublished a contrary decision on the same issue. "The benefits of political friendship" provides a newspaper published report on Liberty Mutual's political ties, including ties to Deval Patrick, the then Governor of Massachusetts. This friendship is alleged to have resulted in Liberty Mutual's receipt of tax breaks in the amount of $41M. "Perspectives Can Change at Liberty Mutual" provides a newspaper published look at Liberty Mutual's claims process, where Liberty Mutual sued its own insured for filing a claim and forced an award against Liberty Mutual. The article also disclosed that Liberty Mutual's legal team that represented the case usually paid less than half of the judgments. "Liberty Mutual: Your premiums, his premium office" provides a newspaper published account of CEO David H Long's desire to redecorate his 1,335 square foot office at a price of $4.5M. The article also discusses whether the insurance company needs to have four corporate jets. "An Untimely Award" provides a newspaper published report of corporate governance at Liberty Mutual. "View from the top at Liberty Mutual" provides a newspaper published report from Boston Globe editor Brian McGrory who was invited to the recently renovated CEO suite at Liberty Mutual. "Lots more to Liberty Mutual pay story" provides a newspaper published report of a comparative analysis of other executives' pay in Boston. "At Liberty Mutual, Accounting To No One For Executive Privileges" provides a newspaper published report and review of itineraries of the fleet of corporate jets and executive compensation which includes "make believe stock options." By virtue of a Mutual-Company setup, its customers own stock in the company. ^ "2017 Financial Review" (PDF). Libertymutualgroup.com. Retrieved November 28, 2018. ^ "Report of Independent Registered Public Accounting Firm" (PDF). Libertymutualgroup.com. Retrieved November 28, 2018. ^ "These are the top 25 property/casualty insurance companies in the US". Insurance Business. May 31, 2016. ^ "2015 Financial Reports". Liberty Mutual. March 31, 2015. ^ "About Liberty Mutual Insurance". Liberty Mutual. Retrieved July 10, 2015. ^ "Liberty Mutual Holding Company Inc". Bloomberg Businessweek. ^ Turner, Greg (June 10, 2011). "Liberty Mutual passes the torch". Boston Herald. Retrieved July 10, 2015. ^ "National Safety Council Honors Liberty Mutual; Says on Workplace Issues, CEO Kelly 'Gets It'". Insurance Journal. March 31, 2005. Retrieved July 10, 2015. ^ Talcott, Sasha. "Insurance firm chief gets $27m in 2009". The Boston Globe. Retrieved July 10, 2015. ^ Luna, Taryn (April 10, 2013). "Liberty Mutual's Ted Kelly stepping down as chairman". The Boston Globe. Retrieved July 10, 2015. ^ "Liberty Mutual Timeline". Insuranceusa.com. July 1, 1912. Retrieved July 11, 2015. ^ "Customer Reviews for Liberty Mutual Group – BBB serving Eastern Massachusetts, Maine, Rhode Island and Vermont". Bbb.org. April 26, 1931. Retrieved July 11, 2015. ^ Mark Hollmer (December 25, 2001). "Liberty Mutual Settles Consumer Suit Critical Of Conversion" (PDF). Insurance Times. Retrieved March 10, 2018. ^ "Liberty Mutual Insurance Group". Fortune. Retrieved March 26, 2018. ^ Coccia, Regis (January 22, 2009). "Liberty Mutual forms midmarket unit, retires Wausau name". Business Insurance. Retrieved July 10, 2015. ^ "Liberty Mutual". The Responsibility Project. Retrieved July 11, 2015. ^ "Liberty Mutual (PBS) - Paul Revere". Vimeo. Retrieved March 26, 2018. ^ "Liberty Mutual (PBS) - Sacagawea". Vimeo. Retrieved March 26, 2018. 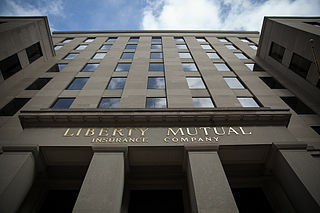 ^ "Liberty Mutual Office Expansion at 157 Berkeley". Libertymutualgroup.com. Retrieved July 11, 2015. ^ "Wayback Machine". Web.archive.org. March 5, 2014. Retrieved November 28, 2018. ^ "Liberty Mutual details structure, leadership after Ironshore deal – Business Insurance". Business Insurance. Retrieved September 28, 2017. ^ a b c d "Business Insurance Services and Career Information". Liberty Mutual Group. December 31, 2014. Archived from the original on July 12, 2015. Retrieved July 11, 2015. ^ "Lab aims to cut rate of injuries on the job – The Boston Globe". Boston.com. June 28, 2004. Retrieved July 11, 2015. ^ "Playing it safely: Liberty Mutual's Research Institute for Safety-celebrating its 50th birthday this month-has been at the forefront of the battle against occupational injuries in the United States. In the next 50 years, it will continue to flex its muscles around the world. - Free Online Library". Thefreelibrary.com. Retrieved July 11, 2015. ^ Withrow, David (July 13, 2004). "In-running nip point hazards". TheFabricator.com. Retrieved July 11, 2015. ^ Theodore W. Braun (2008). "Prevention through Design (PtD) from the Insurance Perspective" (PDF). Journal of Safety Research. Cdc.gov. 39: 137–9. Retrieved July 11, 2015. ^ "Cengage Learning". Accessmylibrary.com. Retrieved July 11, 2015. ^ "Liberty Mutual Serves Up Loss Control Unit for Insurance Agents, Buyers". Insurancejournal.com. October 24, 2008. Retrieved July 11, 2015. ^ "Liberty Mutual closing its research unit - The Boston Globe". BostonGlobe.com. Retrieved August 23, 2018. ^ "Yerger V. Liberty Mutual Group, Inc". Leagle.com. September 24, 2012. Retrieved July 11, 2015. ^ "Claims adjuster overtime ruling a win for employers, insurers". Business Insurance. January 1, 2012. Retrieved July 11, 2015. ^ "Harris Amicus Brief, in support of defendants-real parties in interest". Dol.gov. Retrieved July 11, 2015. ^ "California Supreme Court Depublishes Case Holding That Insurance Adjusters Are Nonexempt Employees | Manatt, Phelps & Phillips, LLP". JDSupra. November 5, 2012. Retrieved July 11, 2015. ^ "At Liberty Mutual, accounting to no one". Retrieved January 17, 2015. ^ McGrory, Brian (May 23, 2012). "The benefits of political friendship". The Boston Globe. ^ McGrory, Brian (October 5, 2012). "Perspectives Can Change at Liberty Mutual". The Boston Globe. ^ "Liberty Mutual: Your premiums, his premium office – Metro". The Boston Globe. May 11, 2012. Retrieved July 11, 2015. ^ "An untimely award – Metro". The Boston Globe. April 20, 2012. Retrieved July 11, 2015. ^ "The viewfrom the top – Metro". The Boston Globe. June 13, 2012. Retrieved July 11, 2015. ^ "Brian McGrory: There's more, lots more to Liberty Mutual compensation story – Metro". The Boston Globe. April 25, 2012. Retrieved July 11, 2015. ^ "At Liberty Mutual, no accounting for executive privileges – The Boston Globe". Boston.com. May 2, 2012. Retrieved July 11, 2015. Wikimedia Commons has media related to Liberty Mutual.